All pet owners are expected to follow interstate travel laws when traveling across state lines. These laws present a certain challenge in some rescue situations. A travel kit is an important part of traveling safely and comfortably. 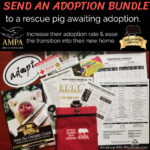 Below are items you may wish to consider while traveling with or transporting rescue pigs.